I suspect most photographers won't publish their crap photos, but I'm not a photographer! There was a stunning rainbow in the west this morning and had to take a picture of it. Having a bit of knowledge about physics I knew that the light was polarized and so I could get the most out of the images by using the polarizing filter I bought a few months ago. What I forgot is that I took it off the camera the previous evening to take the pictures in my previous post and left it out on the lanai to get rained on. So, this is a shot of a beautiful rainbow through some ugly water spots. I've been doing everything I can think of to avoid all these pitfalls, for instance checking the white balance, ISO, exposure compensation but then simply forgot to check if the filter is covered in crap. Oh well, lesson learned, I won't do it again. Yes, the picture looks OK at first glance, but now you know there's a problem, look for the blotches! It was a beautiful rainbow though. There's been something I've wanted to do for the last month but the eyesight hasn't quite been up to driving at night. It's definitely improving though so am feeling a little less depressed about things right now! Andrew, over at A Darker View has taken a few pictures of the Halema`uma`u crater at night which is something I really wanted to do, but know that there's no way I'll ever compete with this picture of his - it's an absolute stunner. I want to go up there and take a picture like his but I don't have the equipment or skill to do that right now, or the ability to handle the drive up to Kilauea's summit, so I'm very jealous! 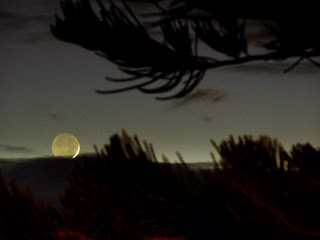 In the meantime, it's pictures from home with a point-and-shoot camera and a whole lot of noise due to its small detector, but the setting moon looked really nice despite having to watch it through the branches of a Norfolk Pine. 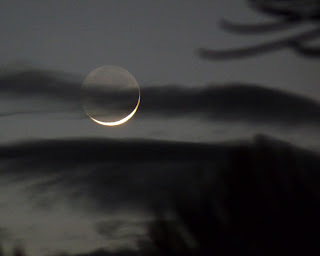 I was a little lucky, I haven't been keeping track of moon phases recently, but saw that there was a crescent moon that was just setting behind the clouds after sunset. It took me a few minutes to figure out how to set the camera up; I'd put it away knowing I wasn't going to use it again for a few weeks, but had to get it out again to catch a picture or two. 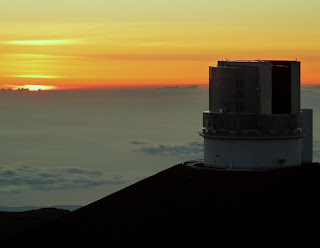 The sunsets and sunrises on Mauna Kea are typically a little special, most of the time you're above the cloud layer so the sun tends to rise above the clouds or set into them, something you don't typically see from ground level. Then again, when I'm not at the summit, there are some sunsets which are beautiful, even if I can't see the sunset from my location. 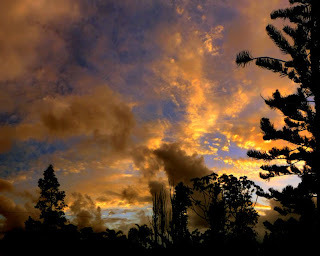 A mixture of high and low clouds will often paint an extraordinarily colourful picture in the sky. This was taken the other evening. I'm trying to stay off the computer and away from the camera as much as possible due to an eye problem that has caused me a few issues for the last few months (actually, years, but has come to a head again this year), but even out of one working eye I can appreciate the colours and beauty of this place. Shame it's being ruined by politics, but where else hasn't? In any case, I had to take a picture of this scene. While at work the other day, Ant told me that a couple of people thought my blog was actually worth a quick read, or at the very least my pictures were nice (or perhaps not utter rubbish). I wasn't aware of this until I was told, so apologies to Andrew and Damon for not saying "thank you" earlier. Hopefully in a few weeks I'll be back to normal and annoying everyone with some more rubbish pictures but have to give the eyes a bit of a rest in the meantime. Seriously, I can't compete with Ant's or Andrews pictures, especially Andrew's scuba diving pictures - they are stunning. For my couple of readers - I'll be offline for a bit due to a minor medical issue. I might explain when I'm back but right now computer screens or photography are a bit of a problem. In the meantime, have fun if you can and if you can't, try to have fun anyway! Those are crepuscular rays by the way. I've taken so many shots of anticrepuscular ones I've been trying to take a shot of crepuscular ones but haven't been able to so far, at least not from the summit. This was from home last weekend. Eddie has the most gorgeous big eyes I've ever seen in a cat. Kittens have them but she's kept them into her later years. She'll be celebrating her 13th birthday in a couple of months but she's as active, athletic and as hard to photograph as she's ever been. The only time I know for certain where she'll be is at the front door when I get back home from work - or on the bed when the alarm goes off in the morning. What a horrible tragedy. I can't even start to think what the families of those lost are going through. Even if all they need is some closure from the search teams finding wreckage and therefore confirming the flight crashed into the ocean, recent news suggests that the wreckage found so far is probably not from that flight. What a horrible ordeal to go through. The flight recorders may never be found. If they are recovered then hopefully the real reason for the tragedy will become clear and the airlines will become even safer than they are now. In the meantime, speculation seems to be the order of the day and unless the real reason for the aircraft's loss is found, we'll be hearing a lot from the crackpot conspiracy theorists. Everything from UFO abductions to government cover-ups will become widespread in the news media and internet and we'll have another generation of people who think critical thinking is something that someone else needs to do for them. In the meantime, there's a fascinating albeit sobering analysis of the weather AF447 experienced on its final flight. The author is very clear about his opinion, he doesn't know what brought down the aircraft, but thinks that weather might have had something to do with it. It's a fascinating read for anyone interested in meteorology and the ITCZ. Air France Flight 447: A detailed meteorological analysis. On 6th June 1944 the greatest military amphibious operation in history took place. Operation Overlord, or D-Day, saw the Allied invasion of Normandy which would lead to the end of World War Two in Europe. 160,000 Allied troops landed on the coastline that day, 5,000 ships were involved in the operation and thousands of people were killed that day. The assault was actually in three phases. First, Allied airborne troops landed behind the German front lines during the night, either using parachutes or landing in gliders. Their aim was to tie up the German defenses, capture bridges and crucial road junctions and destroy whatever German artillery they could find. Second, the Allied air forces bombed the German defenses on the beaches and inland while Allied navies bombarded the landing beaches - their aim was to destroy the defenses and create bomb craters in which the invading troops could take cover. 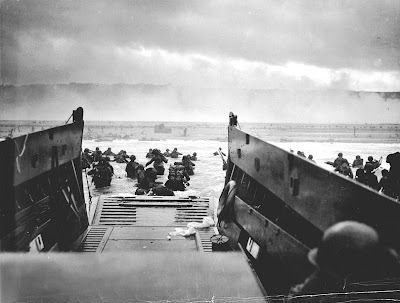 The third phase was the invasion itself, troops in small landing craft landing on the beaches with orders to create a foothold in Normandy from where the invasion of the rest of Nazi-controlled Europe would start. Less than a year later, the war in Europe had been won, although at terrible human cost. This is a special day for me as my father took part in the landings. He was a RDF operator in the Royal Air Force (RAF) and was in a small RAF unit attached the the US army (RDF = Radio Direction Finder, later to be known as radar). The unit's job was to set up a temporary RDF station close to the beach so that the expected air attacks from the German Luftwaffe would be detected in advance and Allied fighters called in to intercept. The Allies were frightened about the devastation large and coordinated air attacks would cause on the crowded beaches so this was viewed as an important job, but as it turned out, the Luftwaffe was a spent force; fuel shortages and Allied bombing had made them almost ineffectual, and their main forces had been pulled back to Germany to defend against Allied bombing attacks that regularly penetrated deep into Germany. Nevertheless, he was over on mainland Europe with the invading forces and remained there for the rest of the war as the Allies pushed towards Berlin and Hitler. He was born in Belfast in 1923 and named "Thomas" by his catholic parents (yes, I'm named after him!). He did extremely well at school and apparently received the highest grades for the Northern Irish equivalent of O-levels in the country, but the family was poor and his education couldn't continue. WWII broke out and he joined the RAF hoping to become a pilot but his eyesight wasn't quite up to it. Instead, he became a RDF (radar) operator and it was his job to guide British night fighters so that they could intercept German bombers during their nightly bombing raids of British cities. He even flew occasional missions in what he considered the greatest aircraft built during WWII , the de Havilland Mosquito. I'm not entirely sure what his role was, but suspect it was to operate and develop the RDF on the night fighter version of that amazing aircraft. After the war he continued to serve with the RAF and eventually moved into the field of meteorology where he served with the Ministry of Defense (MoD) and the RAF both in the UK and abroad, including RAF Wildenrath in Germany and Gan in the middle of the Indian Ocean (he was in Gan when I was born). Afterwards, he worked for the UK Met Office, still attached to the MoD, in Reading, Berkshire and then in an experimental meteorology station - Beaufort Park in Bracknell, Berks. As a young kid I used to tag along with him when he worked weekends and had a hell of a time! I probably screwed up a few experiments, but it was such a fascinating place. Large computers, telex machines, some sort of laser device, cloud detectors, weather balloons, dozens of pieces of experimental technology littered around the site and my favourite machine - the lightning detector! Every hour or so he would connect to several other sites around the UK and using this machine (which looked like a large radar screen) the location of lightning would be determined using triangulation. I was absolutely captivated and it was due to my father and Beaufort Park that my love of science developed. My father passed away 20 years ago after a long illness and I still very much miss him today. Unfortunately I can no longer ask him to tell me stories about his war experiences which I loved to listen to as a kid, but I am so grateful to have had the father I did. I know that if he was alive today he would have just loved to have visited the summit of Mauna Kea and the observatories. He loved science, technology, electronics and even photography! Vog is a combination of the words "volcanic" and "smog" and is used to describe the air pollution created by outgassing from volcanoes. It's a word everyone in the Hawaiian islands recognises, especially those of us who live on the Big Island of Hawai`i. It's a serious health concern as well as a threat to crops downwind from the volcano. With Kilauea being so active these days the vog has been the worst many people can remember. Well over 2,000 tonnes of sulphur dioxide is being pumped out of Kilauea into the atmosphere each day, several times the "normal" amount. On some days the smell of sulphur is quite pervading. The panorama above was taken from the top of Mauna Kea a couple of days ago after the trade winds had just started to return to the islands. Mauna Loa is the mountain in the distance and to get your bearings, east is to the left and south is straight ahead. The trades cleared out the east side of the island but the vog remained elsewhere - it's the murky grey and white crud visible at lower altitudes, although it has been reaching summit level quite frequently recently, which is very rare. Kilauea isn't in the shot, in fact you can't see it from this exact location as it's hidden by Mauna Kea's summit, but if you could it would be about a photo's width to the left. Last week, Andrew posted a picture of the island taken by the crew of of the space shuttle Atlantis which might give you a better picture of the geography of the island and the vog. It's well worth a look! 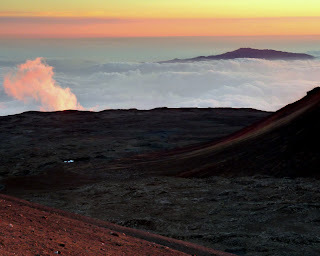 One small and lonely cloud remains near Mauna Kea's summit at sunset. It's quite usual to have plenty of clouds surrounding the summit in the late afternoon and those less experienced visitors might think this is no place to do astronomy. Almost invariably, however, when the sun starts to set and the temperatures drop, these clouds disappear as the convection driving their formation dies away. Sometimes the odd cloud hangs about, perhaps there's a small hotspot on the mountain, but this little fellow will soon be no longer. In the distance the summit of Hualalai Volcano protrudes through the inversion layer. No green flash again, perhaps I'm colour blind? No matter, the sky exhibits some extraordinary colours after the sun has set, but for the astronomers at the summit there's little time to admire the view now. Their workday has just begun. Alright, it's a corny title, I know, but sometimes it gets difficult finding a new perspective for photos at the summit, so here are a couple of reflection shots. The one above shows the NASA IRTF to the left, one of the twin Kecks to the right and behind them in the distance the 10,000 foot dormant volcano Haleakala on the island of Maui. The window belongs to the UKIRT. Facing the other way, the UH 88-inch observatory to the left and Gemini on the right. In between is the somewhat less glamorous summit lunch hut where the daytime engineering crews go for lunch if they're feeling adventurous. I think the summit window cleaner is a little overdue. The plan for tonight is a busy one, a mix of science and engineering observing. I won't have much time for anything other than observing and analysing data tonight, but as usual I did have a few minutes spare to wander outside at sunset in order to harass the tourists. The shot above shows the UKIRT (right) and Gemini (left) just about at the moment of sunset. The ventilation systems are open on both telescopes, this is to allow warm air trapped inside the dome during the day to be blown away and replaced by cold summit air. This lowers local turbulence and improves the image quality both telescope deliver. You'll note, however, that the shutters pointing at the sun (which is behind my left shoulder in this case) are kept closed. This is to stop sunlight hitting the telescope structure and warming it up. Even a small amount of light can warm a vital part of the telescope (e.g., the secondary mirror). The rise may only be a few tenths of a degree, but it can be enough to degrade the image quality significantly. Once the sun has set these shutters will be opened. Dozens of orange-clad tourists join me to watch the sun sink below the Pacific Ocean clouds.